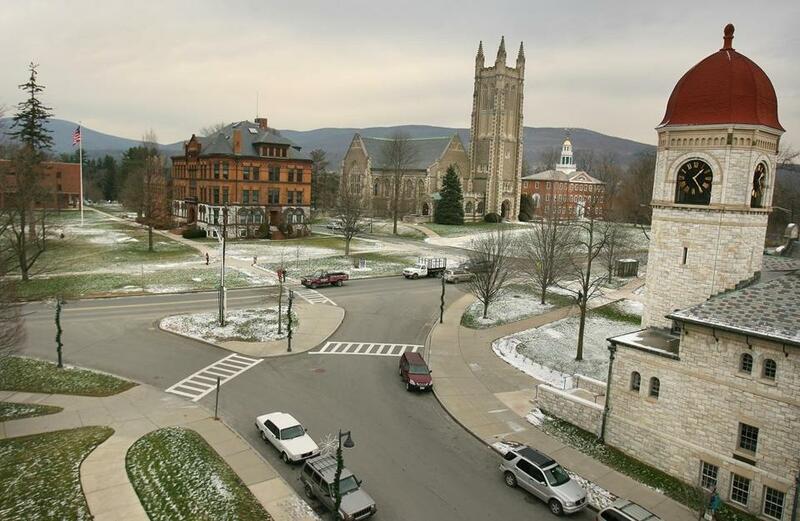 Williams College is one of the schools that’s dropped the SAT requirement. Several top New England colleges have joined a growing number of schools nationally that no longer require applicants to submit scores from SAT subject tests, saying the specialized exams lend little insight into students’ readiness and can work against low-income and minority students. In the past year, Amherst College, Dartmouth College, and Williams College all have dropped the subject test requirement, taking a lead from Columbia University, which announced the new policy this spring. Duke University and Vassar College also no longer require the tests, often called SAT II. The shift occurs amid a larger discussion in higher education about the value of standardized testing in admissions. Some colleges, especially less-selective private schools but also such public colleges as UMass Lowell and Salem State, have made the main SAT and ACT tests optional. The hour-long multiple-choice exams are taken separately from the main SAT and cover 20 subjects, like math, history, chemistry, or a foreign language. Although the tests are no longer required at many schools, they are still optional and in many cases recommended, a nuance many college admissions specialists said means students should still take them if they expect to score well. “You would be misguided to think that strong scores on the tests won’t help you,” said Adam Ingersoll, cofounder and principal at Compass Education Group, a California company that tutors students for standardized tests and counsels them about college admissions. A handful of elite schools, including Harvard and MIT, still require SAT subject tests. Data from the College Board, the company that administers the test, show participation in the subject tests has dropped over the past decade by about 14 percent, with a steeper decline since 2012, when the University of California system dropped them as a requirement. Last year 241,000 students took subject tests, compared to the 1.7 million who took the regular SAT. Mathematics continues to be the most popular subject test, with 144,772 students taking that exam in 2015. Other tests are much more scarcely utilized, like the Hebrew exam, which just 330 students registered for last year. It costs $26 to register for a test date, then $20 per test, up to three per sitting. There are extra fees for sending scores to colleges. Those costs can be prohibitive for low-income students, and even though they can apply for a fee waiver, not all students know about it. Test-prep books and courses can also be expensive, and many low-income and minority students attend high schools where the tests are not emphasized. The decline in test takers is a financial hit for the College Board. Bob Schaeffer, director of the National Center for Fair and Open Testing, estimated that the decline of more than 200,000 tests taken per year over the past five years has cost the College Board more than $6 million each year. Meanwhile, dropping standardized test requirements can help colleges in several other ways. Schools tend to receive more applications, which can drive down their percentage of accepted students, making them seem more selective. Colleges also profit from the additional application fees. Although many experts believe the tests will eventually disappear, schools like MIT find them useful and have no plans to drop the requirement. MIT officials see the exams as an equalizer, a way to consistently measure students from different high schools. Harvard officials said the same thing. Although the shifting policies are a big deal for colleges and testing experts, at least for now they seem to matter little to high school students whose sights are set on elite colleges. Rafael Goldstein, a rising senior at Cambridge Rindge and Latin School, plans to apply to several colleges where the subject tests are optional, like Amherst, and others where they are required, like Harvard. The 17-year-old already has taken the Spanish and US history tests and plans to take a math test, as well. All his friends who recently graduated took at least three, he said. But not all students are counseled to take subject tests. Destiny Mulero, a senior at the Academy of the Pacific Rim charter school in Hyde Park, said her teachers told students to take the ACT, another college admissions exam, because often schools do not require subject tests in addition to the ACT. But Mulero, 17, is not convinced that any test truly reflects her ability to succeed in college. She got a 26 on the ACT and is studying for a 30, out of 36. Mulero, meanwhile, gets good grades. She is president of her school’s National Honor Society chapter, she mentors middle schoolers, and she will direct the tech crew for the school’s fall musical. “I feel like standardized tests are not a good representation of the potential a student can have,” she said.